Gorilla Guard® Spec 30 is a specified high-performance engineered roof underlayment designed for steep-slope roof applications. 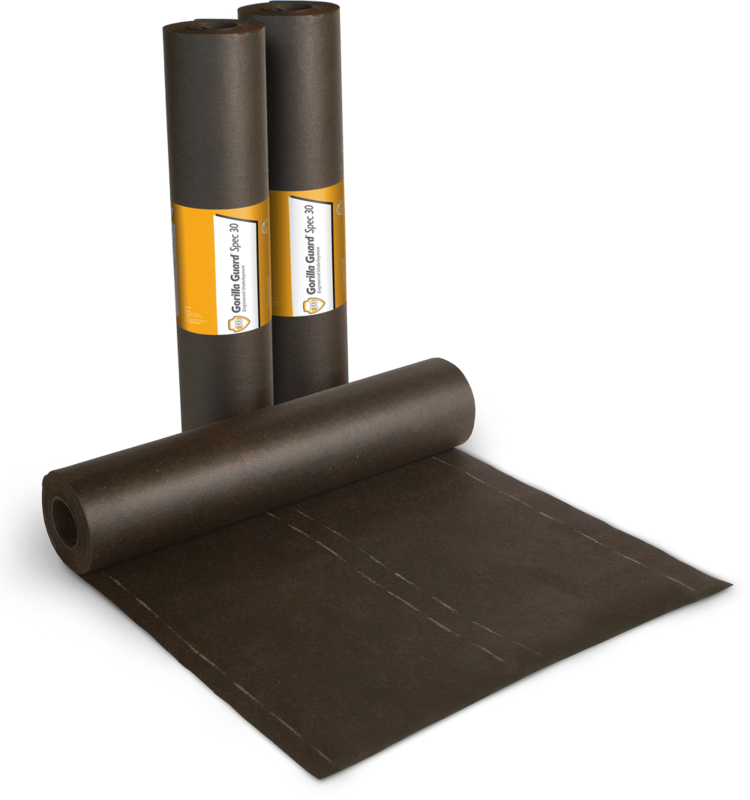 Gorilla Guard® Spec 30 offers a greater pull-through strength and lighter weight than traditional spec 30 felt underlayment and is Miami-Dade County approved. Delivering twice the tear resistance of organic felt underlayment and superior breaking strength, Gorilla Guard® Spec 30 reduces slipping, especially on steep roofs, and resists tear-away from fasteners even in high foot-traffic areas and strong winds. A strong, resilient and reliable barrier is needed between roof deck and shingles. The toughness and durability of Gorilla Guard® Spec 30 is an ideal choice. 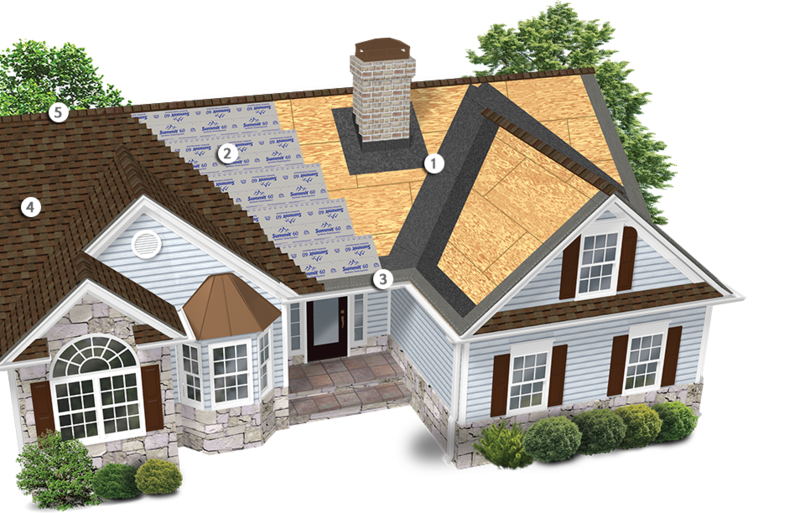 Atlas underlayments can be used in a variety of roofing installations and repairs. Learn and observe safe roofing practices according to OSHA and local building code requirements. Always use caution when walking on sloped roof decks and Gorilla Guard® Spec 30 underlayment. Do not walk on unsecured Gorilla Guard® Spec 30 or any other loose material lying on sloped roof decks. Dust, dew, water and debris create unsafe conditions on the roof. The presence of any foreign matter may drastically change the coefficient of friction (traction) on Gorilla Guard® Spec 30 or any other material on a sloped roof deck. Failure to always use proper safety equipment and footwear can result in serious injury or even death. Gorilla Guard® Spec 30 shall be applied to a properly prepared dry deck that is smooth, clean and free from any depressions, projections, or protruding nails. Roof decks shall be structurally sound and meet or exceed minimum requirements of the deck manufacturer and local codes. Always lay the Gorilla Guard® Spec 30 parallel to the eaves, lapping each course at least 2" over the underlying course. Apply the drip edge underneath the Gorilla Guard® Spec 30 along the eaves and over the Gorilla Guard® along the rakes. Gorilla Guard® Spec 30 should never be applied perpendicular to the eaves. Secure the Gorilla Guard® Spec 30 with fasteners every 12" across the lower and upper edge to hold it in place. If more than one piece is required to continue a course, lap the ends at least 4". End laps in succeeding courses should be located at least 6' from end laps in the preceding course. Lap the Gorilla Guard® Spec 30 a minimum of 6" from both sides over all hips, ridges and valleys. Where a roof meets a vertical surface, carry the underlayment at least 4" up the surface. On decks having a slope greater than 4" per foot, one layer of Gorilla Guard® Spec 30 should be applied. Some local codes may require specific underlayments. On slopes 2" to 4" per foot apply a double layer of Gorilla Guard® Spec 30 over the entire deck surface. Starting with a 19" wide strip at eaves, overhanging the eaves 1/4" to 3/8", cover with full 36" strips providing a 17" exposure. Continue with 36" strips lapping each course 19" over the preceding course. End laps for low slopes shall be 12" and staggered 6' apart. The use of Gorilla Guard® Spec 30 along with the proper decking materials and shingles will help in meeting Class A and or Class C Fire ratings. A shingle by itself is not fire-rated, although it is part of the roofing assembly.